This photo was taken in early July 2013. The "Take it!" was an easy decision. 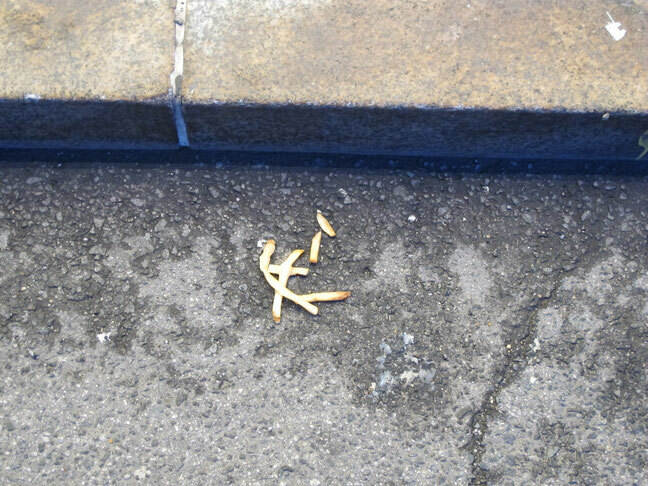 Here were some french fries that had somehow made their way to the street next to the curb. I originally took the photo to see how the colors would contrast and later remembered the phrase about "curbing one's appetite." The juxtaposition was just right. The After Take: Has been fun to show people the shot and watch their reaction and laughter. It is as if french fries are so well known to not be good for one - that it is a sort of joke that so many of us still eat them. Not because of this photo - but just because it is the thing to do - I am now limiting my intake of fries to twice a week at the most. Those fries from McDonald's are the next thing to addictive - lol. Great colors! Your camera work is splendid!